On a late January morning in 1848, James. W. Marshall spotted flakes of yellow metal at the bottom a stream at Sutter's Mill in Coloma, California. The shining substance, of course, was gold. Despite the mill owner – John Sutter's – attempt to keep the gold discovery a secret, the news spread like wildfire and as many as 300,000 gold-seekers descended upon the area over the next seven years. out of the ground during the California gold rush. Henry Wells and William Fargo, saw huge opportunity and founded a banking and express transportation: Wells Fargo & Co. in 1852. They quickly established offices in San Francisco and near most of the major gold mining towns. Wells Fargo began transporting gold from California to the Philadelphia Mint by stagecoach. Those stagecoaches quickly became targets of robberies. "I wish you and Nellie could see the coach that brought us to Bodie. It is a four-horse Concord stage. A shotgun messenger, with a sawed-off shotgun, sits up on the high seat in front with the driver. He has the Wells Fargo Express box between his feet. Going out it is full of gold bullion; coming in it is full of gold coin. "- From Doctor Nellie, the autobiography of Helen MacKnight Doyle, M.D., 1879. The United States Mint became overwhelmed with the massive job of turning that gold bullion into coins. Transporting it to Philadelphia was not only time-consuming, but dangerous, as no railroads existed yet. Thus, President Millard Fillmore in 1850 asked for the creation of a California branch of the United States Mint. 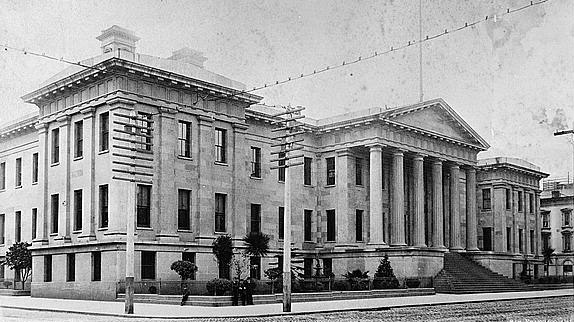 In 1852, Congress approved the plan and the San Francisco Mint opened in 1854. The mint quickly outgrew its first facility, resulting in a new mint in 1874, affectionately called "The Granite Lady." It produced over $4 million in gold pieces in its first year of operation in 1854. It Survived the Massive 1906 Earthquake and Fire. The San Francisco Mint was the only financial institution left standing after the devastating earthquake. Every bank in the city was destroyed or made unusable and their vaults could not be opened. The Old Mint served as a depository for all the disaster relief funds. A group of bankers came together and approved the Old Mint as a place were basic banking functions could take place for all citizens at a time of dire need. Collectors prize coins from the San Francisco Mint. The generally lower production runs at this mint, versus the Denver or Philadelphia mint increase the allure of S-Mint coins. The San Francisco Mint is the only mint to produce the famous Morgan Silver dollar during every year of its production from 1878 to 1921. Learn why this coin is a great choice if you are building a collection on a budget. These are just a few of the prized coins from the San Francisco Mint. The 1893-S Silver Dollar has the lowest mintage of any of the Morgan Dollars issued, which makes it one of the most coveted coins for collectors. Check out an 1892 version of that coin here. The 1909-S Indian Head cent has a very low mintage of only 309,000 pieces. The 1912-S Liberty Head nickel is the first nickel minted in San Francisco and has the lowest mintage in that entire series. What's The Next Coin You Want to Own? Do you have a wish list? Don't see that coin on our site? Call Blanchard today and our numismatists can help source your wish list from collections around the world.